Pneumatic stepper motors are one of the promising alternative actuation methods for motion control in environments where electromagnetic (EM) motors cannot be used. Due to the lack of commercial off-the-shelf products, researchers working on MR compatible robotics have to develop their own pneumatic actuators. This imposes extensive costs and delays on the development process. Additionally, the current solutions are limited in their range of specifications and are difficult to manufacture. 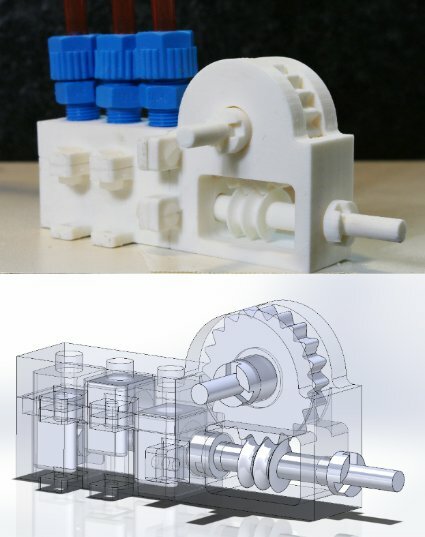 In this paper, proof-of-concept-prototypes for a family of parametrically designed, electromagnetically stealth, rotational pneumatic stepper motors are presented. The main objective of the paper is to demonstrate a general purpose non-electromagnetic actuation method, which can be customized and integrated into any design. Customizability, miniaturization, safety and affordability are some of the key features of the presented work. The developed prototypes are entirely 3D-printed and contain no sealing, bearing or lubrication. Thanks to the low production cost, the motor can be used as a disposable part in surgical applications. Experiments demonstrate effectiveness of the design in terms of cost-efficiency, versatility, MRI compatibility, speed and performance. In order to optimize the design and control algorithm, empirical equations are presented describing response time of a pneumatic system to sequential pressure signals.